Posted on 25, August 2016 by EuropaWire PR Editors | This entry was posted in Education, Investment, Real Estate, Sweden and tagged Linköping, Skanska, Sweden, Vallastadens school. Bookmark the permalink. STOCKHOLM, 25-Aug-2016 — /EuropaWire/ — Skanska has divested Vallastadens school in Linköping, Sweden, for SEK 200M. The buyer is Vacse AB, pension funds formed by seven major Swedish companies; Atlas Copco, Pharmacy Company, Ericsson, Sandvik, Skanska, Stora Enso and Volvo. The transaction will be recorded by Skanska Commercial Property Development in the third quarter 2016. The transfer of the property to the buyer will take place in July 2017. Vallastadens school is an elementary school with a capacity for 600 students that Skanska builds. 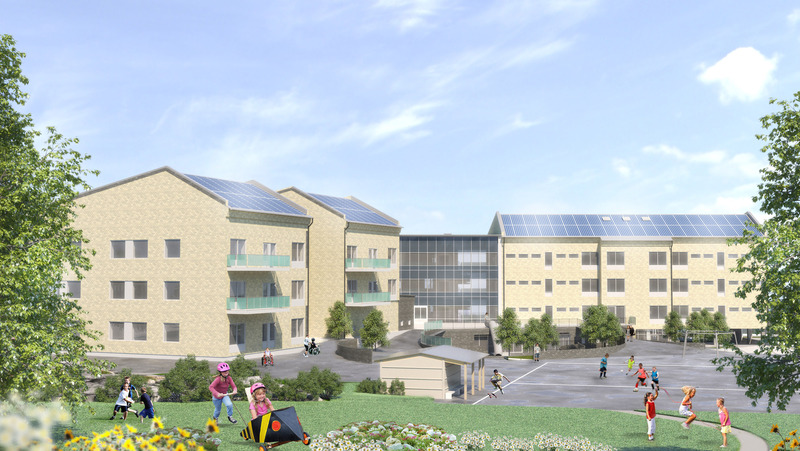 The school will be completed next summer, and a 15-year lease has been signed with the municipality of Linköping. The intention is that the school will be certified according to the environmental certification system Green Building. Features include a glass facade with integrated solar cells and solar panels on the roofs. The school yard is generous with a small forest and walking paths, sports field and plenty of playground equipment. The school building will have a private kitchen and a gymnasium. Vallastaden is a new area that is emerging just west of Linköping city center near the university. In total, it is planned for about 1,000 homes in the current phase, ranging from townhouses to apartment buildings where variation is the main theme. Skanska is one of the largest project development and construction companies in Sweden, with operations in building and civil engineering as well as in residential and commercial development. The unit has about 10,000 employees. Revenues from construction amounted to SEK 27 billion in Sweden in 2015. Residential development sold about 2,200 new homes. Skanska also offers services in public-private partnerships.